Click on any of the "Add to Cart" or "View Cart" buttons to add a sample item to our demo cart. A Ken Griffey Jr. autographed MLB baseball. Baseball is a numbered and limited 72/100 balls signed by Griffey. Inscription "500 HR" to his signature. COA and numbered sticker from Upper Deck! This item has the following attributes and values; a weight of 1lb., originating zip code of 01610, and price of $42.00. This is the form used to create the buttons and dropdown menus in the cart. This is the results of the Wizard. Copy the code and paste it onto any web page to view the cart button. The timeless elegance of a pen finished in gold or palladium can be yours. The Chinese lacquer has a depth of hues and a creativity of design rarely seen. The fountain pen has and 18kt solid gold nib decorated with rhodium. Ballpoint pen can be converted in a mechanical pencil. Insert is included. 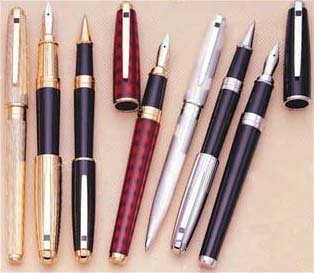 Rollerball pen can also use ballpoint and felt tip refills. This item has the following attributes and values; a weight of 1lb. 1oz, originating zip code of 01610, a base price of $270.75, and 3 different attributes which affect price not weight. 6 megapixels for photo-quality prints up to 8 x 10. 3x Optical Zoom-Nikkor lens for sharp, clear images. 15 Scene Modes automatically adjust controls for great pictures instantly. Scene Assist guides you to take better pictures in Portrait, Landscape, Sports and Night Portrait modes. Movie Mode allows the capture of live action in QuickTime� Movie format. This item has the following attributes and values; a weight of 3lb. 5oz, a single Extended Service Plan, originating zip code of 01610, and price of $179.95. Copyright © 2019 AuctionInc. A division of PAID, Inc.